A tragic mum-of-two robbed of looking after her children by a cruel disease, attacked a woman after "bad mother rumours," a court was told. Kelly Louise Wilkins confronted Sarah Auty in the street, shouted at her: "say it to my face," thumped her in the left eye and threatened to kill her. She later told police she wasn't sorry for what she had done. 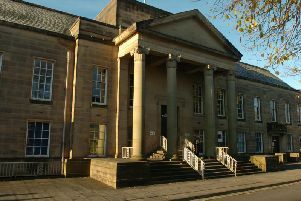 The pair had at one time lived at the same housing association project on Elizabeth Street, Burnley, the town's magistrates heard. The hearing was told how Wilkins, who is 26, has the hereditary disease Huntington's Chorea - which causes the death of brain cells - and which means she can't look after her children. Her father can't move and is on life support at the age of just 52. Wilkins knows a similar fate awaits her. The condition causes her to have impulses she can't control. Wilkins, who consumes between 3,000 and 5,000 calories a day because of the disease, also pinched sweets, crisps and an energy drink worth £7 from Poundworld. She has racked up huge debts due to impulsive spending sprees. The defendant was accompanied to court by her carer from Calico Housing Association. Wilkins still lives at Elizabeth Street, but is set to move to another project with more support as her health deteriorates. Prosecutor Tracy Yates told the court Miss Auty was shopping and was in the Market Square in Burnley when she was approached by Wilkins, who was screaming and shouting at her. The defendant grabbed her and punched her in the face. She was continuing to shout at her. Mrs Yates said the victim told police two ladies come towards her and one told Wilkins to move and leave her alone. The other took hold of her and pulled her away. Wilkins shouted : "Yeah, you better get her away, I'm going to kill her." The prosecutor continued: "She says she was upset, scared and shook up. In interview, the defendant said she and the victim used to live together at Elizabeth Street. She ( Wilkins) has two children who are not with her as she is unable to look after them because she has Huntington's Disease. She heard rumours that Miss Auty was saying she had lost her children because she was a bad mother. " Stuart Kaufman (defending) said Huntingtons Disease was genetic and her father was currently on life support. He added: "One of the characteristics is extreme impulsiveness." The solicitor said Miss Auty had left the housing project some time before, but Wilkins may have been dwelling on rumours she heard the woman had allegedly been spreading, that her children had been taken off her because of mistreatment. Mr Kaufman said that impulsiveness also related to the shoplifting offence. Wilkins now had lots of involuntary movements. He went on: "It's a process of deterioration in the brain. She consumes between 3,000 and 5,000 calories a day. That is caused by that involuntary movement." Wilkins admitted assault by beating last December 13th and theft on January 6th. She was conditionally discharged for six months and must pay the victim £50 compensation.